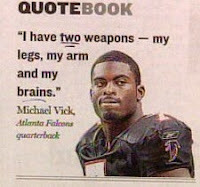 The report came out tonight that Michael Vick is going to be playing for the Eagles. Thank goodness. The team I dislike the most signs the convicted felon. Philadelphia has the fans with the least amount of class (see: cheering when Michael Irvin laid motionless on the turf), and now they have the biggest creepo in the league. The perfect marriage as far as I am concerned.